Each year my family desperately tries to make it to the beach before it gets too cold. School schedules make it nearly impossible to take advantage of off-peak rates. However, fantastic parents and in-laws made it possible for my wife and I to spend our eighth anniversary in South Walton for some much-needed rest. Any beach excursion, I think, needs to be accompanied by some light reading. This is usually a good opportunity to switch to fiction selections for me. However, I just can’t seem to do it. I have great intentions but I usually end up reading non-fiction. However, rather than try to stretch my intellect by reading authors I can’t understand (that is my year-round approach), I opt for some “Christian Inspiration.” This is that random section at Barnes and Noble that is not “Christian Fiction,” nor is it “Christian History” or “Theology.” In other words, light beach reading that won’t make your head hurt. Last year’s selections were “Mirror Ball” by Matt Redman, “Scribbling in the Sand,” by Michael Card, and “To Own a Dragon” by Donald Miller. This year’s selection included one book I had already started reading before the trip, one book I began reading at the end of the trip, and a short book I read in a 24-hour period (an great feat for me). Praise Habit by David Crowder turned out to be the perfect beach read. From the outset, I’d suggest that Praise Habit is a secret door into a sacramental understanding of the world. 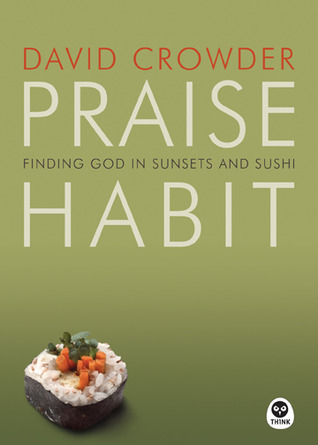 I’m not sure he ever uses the word but the subtitle might as well scream it: Finding God in Sunsets and Sushi. That is practically a definition of “sacramental.” There is some connection between the material world and its creation. Crowder’s thesis is to convince us no matter how mundane our day-to-day life might be, worship is an orientation of our hearts, a developed habit. Because of this premise, I found Praise Habit to be a great, down-to-earth supplement to James K. A. Smith’s Cultural Liturgy series. Crowder used plainer language and referred to fewer french philosophers but employed a lot of the same ideas. Basically, our hearts are oriented toward praise, toward worship. The monotony of daily life is not as disconnected to our relationship with God as we might suppose. Worship is not just some tangible act but a disposition as well. After a few chapters of explanation, Crowder makes a classic “worship guy” move by turning to the Psalms. The second half of the book is a brief devotional-like commentary on 21 Psalms. Each Psalm is illustrated with a helpful anecdote, which is often amusing. Rather than laboring the point, Crowder usually wraps up each commentary with a paragraph or two of reflection. Also included in one of a the chapters is a great introduction to lectio divine. At 156 pages, Praise Habit is a fun read, filled with lighthearted candor and a helpful message. I recommend it for all worship leaders or anyone who might be looking for a brief morning devotional on a few Psalms. This entry was posted in Book on October 10, 2013 by peenerbutter.